Adrenaline Boost now increases the speed ("performance") of a building, not just its output. Scrap all now only does all iron mines, etc. Canyons now generate usable tiles other the other side of a deep gap, instead of large empty expanses. New descriptions/tooltips for black market items. Updating certain building assets to not hide their terrain tile. Lots of work on the new UI! First pass will probably in Beta 5. 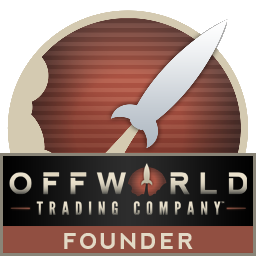 Adding Offworld Market construction animation. Sound plays when a quickmatch connection is made. All sabotage types have their own auction sound that plays when they are put on the market. Adding field so that in mods HQs can be marked as unplayable for human players. Fixed cursor error in main game. Did you fix the UI being unplayable on OS X? I wish steam refunds were changed before buying this game. Your OS X requirements are a lie and this is probably the worst 40$ I've ever spent on steam. Did you fix the UI being unplayable on OS X? The auto-double click issue has been fixed. I should have included it in the patch notes. While the interface latency is still present on all systems (and it looks like Beta 6 will have the first pass at our solution), the Mac version should be much more playable now.